Meet today’s demand for IP networks and narrow-band radio operations with the high performance GTR 8000 Base Radio / Expandable Site Subsystem. 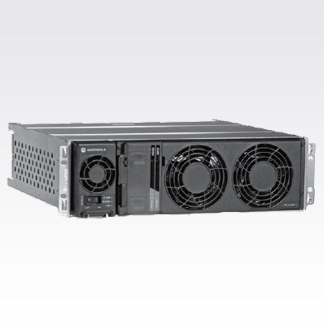 The GTR 8000 surpasses the bar previously set by QUANTAR™ offering software-based upgrades and migrations, no single point of failure, hot swap hardware, front access serviceability, and integrated battery charging. Its state of the art compact design enables everything from basic Analog Conventional to advanced P25 TDMA Trunking on the same hardware. The GTR 8000 ships tuned from the factory for quick and easy deployment. ASTRO 25 & Analog Conventional: GTR 8000 Expandable Site Subsystem (ESS), Motorola's premier turnkey RF site design, provides the optimal P25 trunking solution for easy installation and high availability. All base radios, networking equipment, timing and frequency distribution, RF combining and multi-coupler equipment are factory integrated into a single rack or cabinet. ASTRO 25 Trunking: Motorola's Conventional channel solutions range from small single repeater sites to wide-area coverage voting and simulcast systems. The GTR 8000 Base Radio’s high performing analog capabilities enable narrow-banding migrations that maximize audio performance. ASTRO 25 Data: Motorola’s Integrated Voice and Data (IV&D) in ASTRO® 25 trunking and conventional systems as well as High Performance Data (HPD) are supported by the GTR 8000. Voice and data transmissions switch dynamically on the same base radio for ease of use.